In electronics, the Darlington transistor (often called a Darlington pair) is a compound structure consisting of two bipolar transistors (either integrated or separated devices) connected in such a way that the current amplified by the first transistor is amplified further by the second one. This configuration gives a much higher current gain than each transistor taken separately and, in the case of integrated devices, can take less space than two individual transistors because they can use a shared collector. Integrated Darlington pairs come packaged singly in transistor-like packages or as an array of devices (usually eight) in an integrated circuit. The Darlington configuration was invented by Bell Laboratories engineer Sidney Darlington in 1953. He patented the invention of having two or three transistors on a single chip sharing a collector. A similar configuration but with transistors of opposite type (one NPN and one PNP) is the Sziklai pair, sometimes called the "complementary Darlington". A Darlington pair behaves like a single transistor with a high current gain (approximately the product of the gains of the two transistors). In fact, integrated devices have three leads (B, C, and E), broadly equivalent to those of a standard transistor. Darlington pairs are available as integrated packages or can be made from two discrete transistors; Q1 (the left-hand transistor in the diagram) can be a low power type, but normally Q2 (on the right) will need to be high power. The maximum collector current IC(max) of the pair is that of Q2. A typical integrated power device is the 2N6282, which includes a switch-off resistor and has a current gain of 2400 at IC=10A. A Darlington pair can be sensitive enough to respond to the current passed by skin contact even at safe voltages. Thus it can form the input stage of a touch-sensitive switch. Darlington transistors can be used in circuits involving motors, relays, or other current-hungry components connected to computers. The current is amplified from the normal low level of the computer output line to the amount needed by the connected device. A typical modern device has a current gain of 1000 or more, so that only a small base current is needed to make the pair switch on. However, this high current gain comes with several drawbacks. For silicon-based technology, where each VBEi is about 0.65 V when the device is operating in the active or saturated region, the necessary base–emitter voltage of the pair is 1.3 V.
Another drawback of the Darlington pair is its increased "saturation" voltage. The output transistor is not allowed to saturate (i.e. its base–collector junction must remain reverse-biased) because the first transistor, when saturated, establishes full (100%) parallel negative feedback between the collector and the base of the second transistor. Since collector–emitter voltage is equal to the sum of its own base–emitter voltage and the collector-emitter voltage of the first transistor, both positive quantities in normal operation, it always exceeds the base-emitter voltage. (In symbols, always.) Thus the "saturation" voltage of a Darlington transistor is one VBE (about 0.65 V in silicon) higher than a single transistor saturation voltage, which is typically 0.1 - 0.2 V in silicon. For equal collector currents, this drawback translates to an increase in the dissipated power for the Darlington transistor over a single transistor. The increased low output level can cause troubles when TTL logic circuits are driven. Another problem is a reduction in switching speed or response, because the first transistor cannot actively inhibit the base current of the second one, making the device slow to switch off. 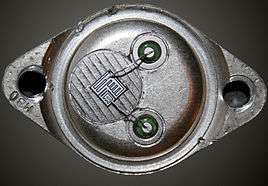 To alleviate this, the second transistor often has a resistor of a few hundred ohms connected between its base and emitter terminals. This resistor provides a low-impedance discharge path for the charge accumulated on the base-emitter junction, allowing a faster transistor turn-off. The Darlington pair has more phase shift at high frequencies than a single transistor and hence can more easily become unstable with negative feedback (i.e., systems that use this configuration can have poor phase margin due to the extra transistor delay). 1 2 Horowitz, Paul; Winfield Hill (1989). The Art of Electronics. Cambridge University Press. ISBN 0-521-37095-7. ↑ Similarly, an emitter follower never saturates because of the 100% series negative feedback. Another example is an "active diode" made by a transistor with joined base and collector (e.g., the current-setting part of a current mirror). ECE 327: Procedures for Output Filtering Lab – Section 4 ("Power Amplifier") discusses Darlington pairs in the design of a BJT-based class-AB current driver in detail.